Strange but true. High-quality bouldering in the middle of Manhattan. Compared to just about any other bouldering area in the country, the actual extent of bouldering opportunities on natural rock in New York City is minuscule. On the other hand, there are few major cities in the world that offer more or better climbing than what is found right in the heart of Manhattan. At first glance, it is easy to dimiss the modest the glaciated outcroppings of gray/black Manhattan schist that are strewn across the various parks of New York City. But if one takes the time to explore these odd, bullet-hard boulders, one comes to understand what a wonderfully unexpected resource of quality climbing they provide in the most unlikely of settings. While there are possibly over a dozen locations to climb at in the immediate metropolitan area, this guide is strictly concerned with only the most popular and accessible climbing areas. And for the simple reason that Manhattan and its adjoining boroughs have an infinite amount of buildering, natural rock climbs (with the notable exception of the Riverside Park Boat Basin and 72nd Street walls) are the primary concern of this guide. There are many areas that do not appear to be worth the subway or bus fare or risk of personal injury for most climbers. Although "unpopular" some of these areas do present rewarding routes and problems and they have been listed in the "Other Areas" section for the determined and adventurous. The purpose of this guide, first and foremost, is to make available a concise reference to the "best" bouldering in Manhattan. In what is possibly the most urbanized lot of land in the entire world, one can find, without too much trouble, enough quality rock to keep any dedicated climber busy for several months. While it might not be Hueco or the Buttermilks, bouldering in Manhattan does have its own unique rewards. 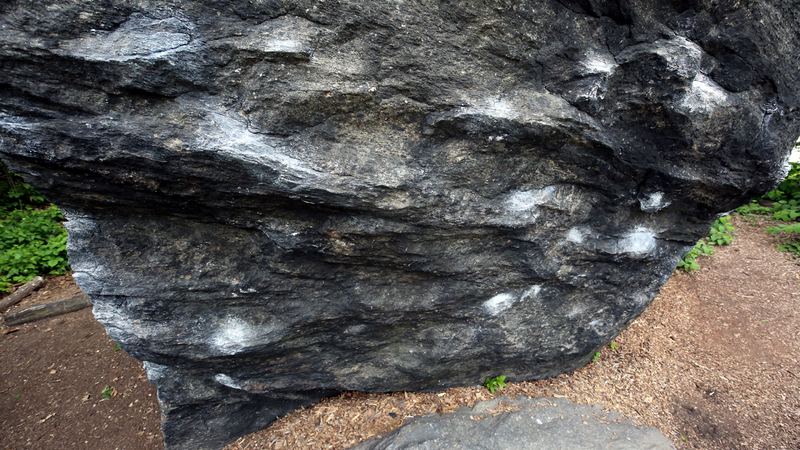 To walk off a major Manhattan avenue with its high end stores and restaurants, into the leafy splendor of the park and lay hands on hard metamorphic rock that offers dozens of quality boulder problems is a singular experience that all climbers can appreciate. Near the northern end of Central Park, a "worthless" boulder beckons. Prior to 1987, access to climbing in Central Park and other city locations had been an on-and-off problem. There was no formal relationship between park officials and climbers and additionally, before the era of indoor climbing walls and ESPN, very little was understood about the sport. Despite long periods of hassle-free climbing, there were sporadic instances of what climbers considered harassment by park law enforcement. Several such incidents in 1987 prompted Ralph Erenzo and Nick Falacci to create the City Climbers Club of New York (CCCNY) in an attempt to work out a cooperative approach between climbers and park officials. 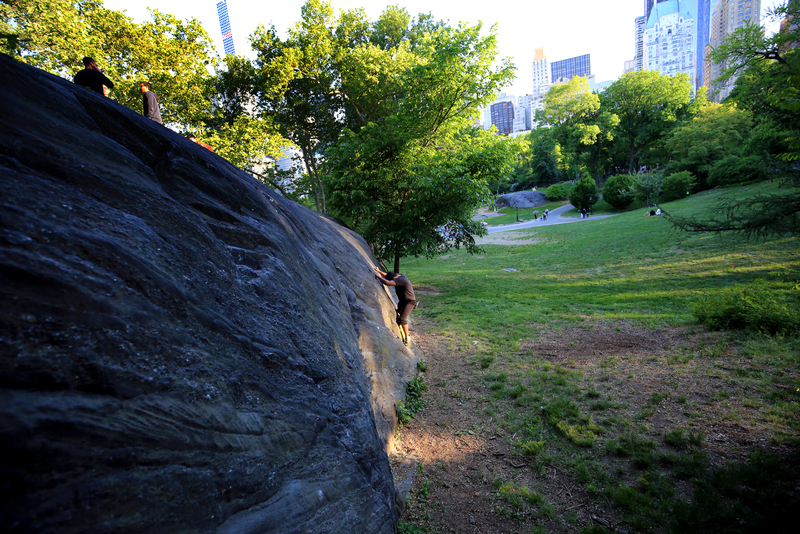 What soon followed was an agreement between the Central Park Conservancy, the NYC Parks and Recreation Department and the CCCNY to allow access to many city park locations for ropeless climbing. Vista Rock, beneath the Belvedere Castle, was agreed to be off-limits given its height, bad landings and location of both a visitor's and children's center. An excellent relationship between city officials and the City Climbers Club soon developed and led to area clean-ups and the laying of wood chips at popular boulders. In 1989, the city approached the City Climbers Club about constructing and maintaining an indoor climbing facility. The result was New York City's first indoor climbing wall, stil in operation at the West 59th Street Parks and Rrecreation facility. An annual permit to the CCC gym provides not just year round access to the gym, but also access to the boulders of Central Park, Ft. Tryon and Inwood Park. One does not need a gym permit to climb at these areas, but having one does provide documentation if confronted by police officers or park enforcement personnel. Presently, there have been reports of regional officials who may be unaware of the agreement between the CCCNY and the Parks and Rrecreation Department and have attempted to limit or ban climbing in Ft. Tryon and Inwood Park. Until these matters are resolved, it is best to visit these areas with low visibility and minimal impact. If confronted by park officials, please do as requested and leave the area. Instead, report any incident of refused access to the City Climbers Club. At this writing, there does not seem to be any issues with access in Central Park. About 400 million years ago, 150 million years before the Appalachians were formed and 100 million years before there were even winged insects, black mud on the ocean floor was pushed downward, heated, squeezed, contorted, heated again and recrystallized by the movement of continents.. This rock was eventually pushed up to create a mighty mountain range possibly higher than the present Himalayas. Unfortunately, the creation of the alpinist (or anything with arms and legs for that matter) was still a long way off. 200 million years ago, the African and North American continents split apart and created the Atlantic ocean. Our wonderful primeval mountain range was eroded down to nothing over the next 75 mllion years until all of it was dunked under the Atlantic, not to dry off for another 40 million years. When the ancient rock finally reappeared, the Ice Age was in full swing and great sheets of ice plowed indolently over the land. 20,000 years ago, the last plodding, thousand-foot thick, glacier scoured, polished and striated what was left of the heart of that ancient mountain range, leaving behind what he find today: mica schist outcroppings with smooth, polished tops with gentle slopes on some sides and steep faces on others. Presently, nature (wind, rain, heat and cold) and man (construction, general abuse and climbers) are continuing to erode the rock.